In the 39th in a series of posts on 2011 short story collections entered for The Story Prize, intern Phedra Deonarine interviews Alethea Black, author of I Knew You'd Be Lovely (Broadway Books). 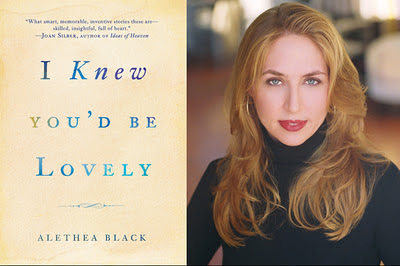 Alethea Black: An ideal collection would be one that surprises me and enlists my heart. I suppose I'm drawn to the same things in stories that attract me in people: charm, inventiveness, humor, compassion, intelligence. When I was first learning to write, collections by Lorrie Moore and Ralph Lombreglia moved me deeply. This year, I'm loving the new books by Jim Shepard and Steve Almond. My all-time greatest hits include Jesus' Son and The Things They Carried. PD: Which story in your collection required the most drafts or posed the most technical problems? AB: "Mollusk Makes a Comeback" It was one of the first stories I ever wrote, and it went through many, many drafts (and many bad titles, including "Doughnut Holes" and "Please Continue to Hold"). I don't save all the iterations of a story as I work—if I did, my desktop would be even more cluttered than it is—but the collected drafts of that story would almost be an archaeological record of someone learning how to write. Conflict is the engine that keeps a story rolling—I sometimes tell aspiring writers that every story is about two dogs and one bone—yet "Mollusk" was a story about a woman in conflict with herself. Inner conflict is difficult to portray without committing any number of literary sins, and I struggled with a way to dramatize her paralysis and boredom without making the story itself boring and inert. PD: What are you working on now? AB: I'm still tweaking a short novel called The Key, even though it's officially finished and with my agent. (I think I've entered the editing phase Oscar Wilde described: "I was working on the proof of one of my poems all the morning, and took out a comma. In the afternoon I put it back again.") I also have notes for the next book, called The Lucky Brother, but I'm circling in the grass and have yet to lie down with it. AB: I've had the most wonderful teachers, to whom I'll always be grateful: Lee K. Abbott, Alice Elliott Dark, David Gates, Joshua Henkin, Jeff Jackson, Thom Jones, and Meir Ribalow. PD: What is your writing process like? AB: I often write at night, in bed. I felt bad about writing in bed until I learned that Sid Mukherjee is also a bed-writer. I wish I could wean myself from the nocturnal schedule, but I suppose I should simply be grateful the work gets done. (I wrote about this habit recently) I have little method or ritual, and I confess I'm not a big self-disciplinarian. If I'm in the thick of a project, I might write all day for weeks, but there are also fallow weeks when I don't write at all. PD: Were there any stories you wrote and wanted to include, but that didn’t make the cut for this volume? AB: I have a triptych of short shorts that my editor and I briefly considered including, but we already had an Author's Notes appendix, telling the stories behind the stories; to have some sort of dim sum surprise as well felt too complicated. I'm now glad we didn't. I don't think flash fiction—my own, at least—provides as satisfying a narrative experience as longer stories. And I like to satisfy.